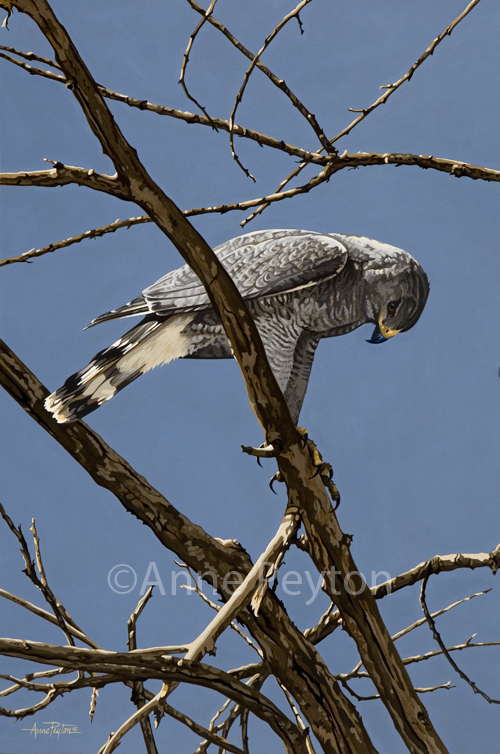 “During the Sonoran Desert summer, the high ‘keeer’ call of the Gray Hawk is a familiar sound along riverbeds. Often these small hawks can be seen soaring over the trees looking for prey in the trees and along the fields and scrub on either side. They are unmistakable in the air and command your attention. “On one of our trips, we found an active nest high in a dying cottonwood. The female was calling but we couldn't see her or any offspring. When the smaller male came back with a small mammal she took the food and came to another dying tree to eat while he stayed at the nest.